Onc e the home of Martha Brookes Hutcheson, one of America’s first female landscape architects, this pastoral property includes many classical garden elements, including ha-has and allees, all planted with a palette of native plants and assembled for the joy of discovery. 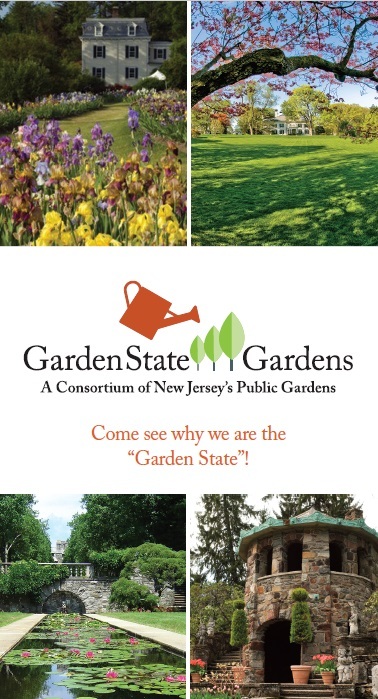 Colonial Park Gardens, managed by the Horticulture Department of the Somerset County Park Commission, features a 144-acre Arboretum of labeled specimens of flowering trees, shrubs, evergreens, and shade trees; a Fragrance & Sensory Garden designed to be of special interest to visitors who are visually or physically impaired; a 5-acre Perennial Garden with beautiful displays of annuals, perennials, and ornamental grasses; and the Rudolf W. van der Goot Rose Garden, a formal garden displaying over 3,000 roses of 325 varieties. Grounds For Sculpture, the 42-acre sculpture park and arboretum in Hamilton Township, NJ, features over 270 contemporary sculptures outdoors and rotating exhibitions in six indoor galleries in addition to offering concerts, performances, family festivals, classes, fine dining, and shopping year-round. 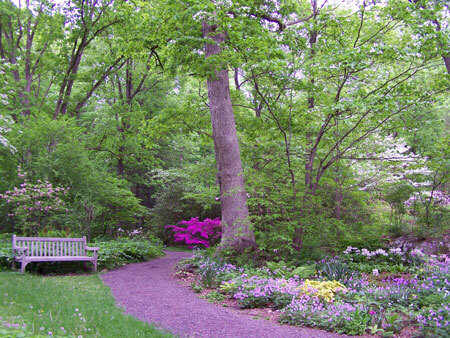 The Leonard J. Buck Garden, managed by the Somerset County Park Commission, is an inspiring public garden with national horticultural significance distinguished by a series of planted rock outcroppings and woodland gardens with naturalistic displays of bulbs, wildflowers, ferns, and shade perennials within a 29-acre rocky ravine. 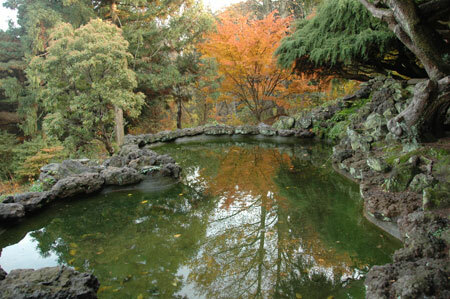 Marquand Park and Arboretum is a 17-acre historic preserve of trees and woodlands that offers a variety of recreational and educational experiences in the center of Princeton. Originally the landscaped garden of a 19th-century estate, the park has a rich collection of native and exotic trees reflecting the interest and tastes of its previous owners and its current beneficiaries. Some trees in the parks are the largest of their kind in New Jersey. 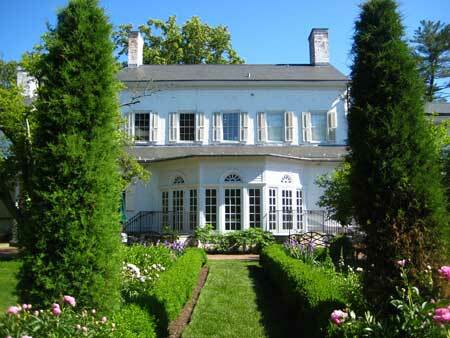 The gardens at Morven, home of a New Jersey signer of the Declaration of Independence, are a patchwork of history. The phlox and peonies of the Colonial Revival Garden, the restored horse chestnut walk, and the elm allée reveal pieces of the past; the demonstration kitchen garden evokes the 19th century vegetable garden. The newest garden element, a re-imagined water feature, focuses attention on the mid-20th century Art Moderne period. Located just minutes from Princeton, the stunning 100-acre arboretum boasts a classical style, mature with lush trees, shrubs and under-story plantings. Cultivated since the mid-eighteenth century, the arboretum’s three pristine ponds, veteran trees and highly-evolved landscape are home to an abundance of birds and wildlife. 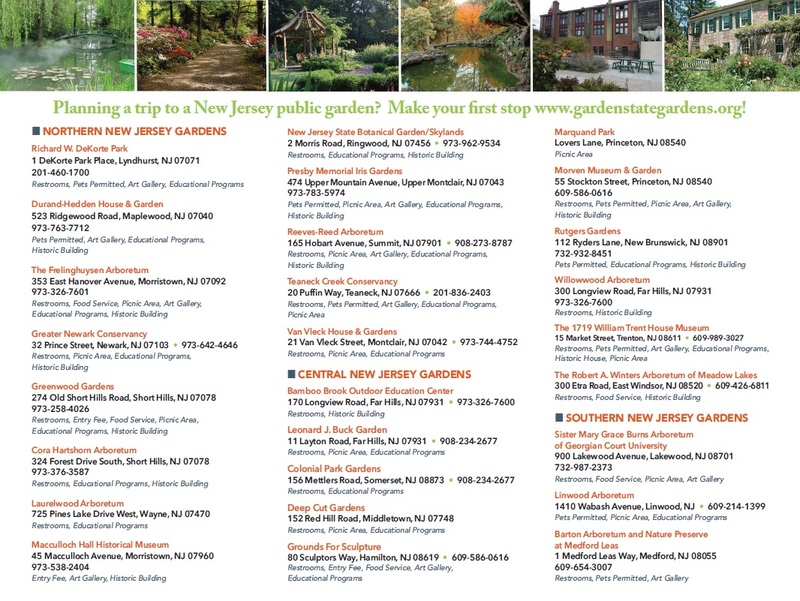 Rutgers Gardens, located on Ryders Lane, on the outskirts of Cook Campus, is a setting for many different programs, events, and recreational activities. 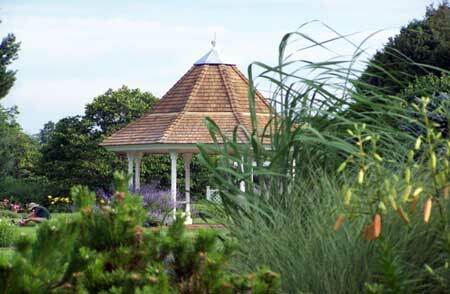 A place of learning and beauty, the official botanic garden of Rutgers University features 60 acres of designed beds, specialty gardens, tree and shrub collections, lawns, and walking paths, which adjoin the 70-acre Frank G. Helyar Woods. With a vibrant array of Garden Series courses, family and youth programming, and special events for the community, it is our goal to provide a fun, educational, and engaging place to enjoy the natural world. The 1719 William Trent House Museum stands on 5 acres amidst state office buildings and parking lots in the city of Trenton. The original Georgian style estate house is in immaculate condition with period furnishings. Guided tours of the House and self-guided tours of the gardens are available Wednesday through Sunday, except public holidays, between 12:30 and 4:00 pm. The grounds include a kitchen garden planted with herbs and vegetables that would have been planted on the estate in the early 1700s as well as a small apple orchard of heritage varieties that were available at that time.